Houston, we have a cowl problem. As, it seems, do all Ercoupes. Our problem started with a nose cowl crack. We’d just bought Tess, and the crack was brought to my attention during the first of her many, many rounds of maintenance. My options were to buy a used replacement nose cowl from the Ercoupe junkyard guy for $500 bucks (which would probably crack, too), buy a new cowl from Univair for $1,200 bucks (which would probably crack, also), or have my guys “patch” it. Silly me, I opted for the patch, and when Tess came home from her mechanics, her beautiful, flat nose was covered in brass rivets. It looked like Machine Gun Kelly strafed us on the runway. This was just days before our first Ercoupe convention, and I was mad as hell. It was not the first impression I wanted to make. I spent the afternoon sitting on an upside-down bucket with a Q-tip and a can of metallic touchup paint, painstakingly covering each and every one of the 43 brass-colored rivets with dark blue paint. It was slow going. Metallic paint doesn’t like to stay stirred. Or to stick to brass. In the end, while my handiwork wouldn’t pass close inspection, or win a Lindy at Oshkosh, from any respectable distance it didn’t look too terribly bad. But since then, every year it seems, a new crack develops, and more rivets get shot into the nose bowl. 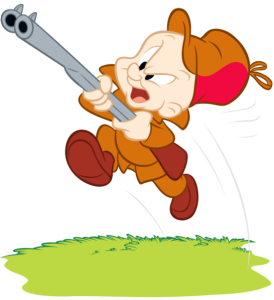 Rather than Machine Gun Kelley, on close inspection, it now looks like an inebriated Elmer Fudd blasted Tessie’s nose with his double-barreled shotgun. Truth be told, there’s actually no original metal left at all. I’m flying behind a solid mass of rivets. Now, not to whine about money (again), but I think I might have mentioned that while Ercoupes are very affordable to buy—less than most cars—the problem with airplanes is that, sorta like kids, the real costs start when you bring them home from the hospital. All these patches weren’t cheap. I could have easily bought two new nose cowls for what I’ve paid in patches over the years. In fact, that’s what my mechanic mentioned sorta off hand as he handed me the latest invoice. Naturally, the next day, a new crack developed. Normally, at this point the decision would have been obvious, but there are extenuating circumstances. The first is that there’s an airplane paint job on my horizon. And I was sorta thinking about replacing the entire cowl, not just the nose bowl, before the painting, as it’s all in pretty bad shape. 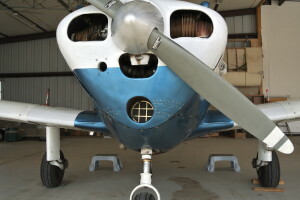 But that aside, even if I just wanted to get a new nose bowl, it doesn’t make much sense to pay to have it painted when the whole plane is going to be painted in a few years, nor would it make sense to leave unprotected metal out in the elements just because a paint job is on the horizon. But that’s not all. Now there are three options for new cowls. Univair still has the original thin aluminum nose bowl, but Alpha, who bought up a lot of mods from Skyport when they shut down, nearly have FAA approval for two more options. 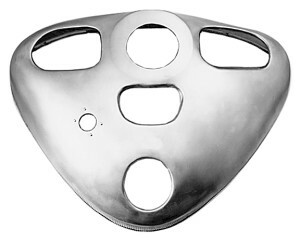 One is the original-style nose bowl, but made of a reportedly more crack-resistant fiberglass. It also promises to be cheaper. And additionally, they are bringing back a product called the Kinney Speed Bowl. 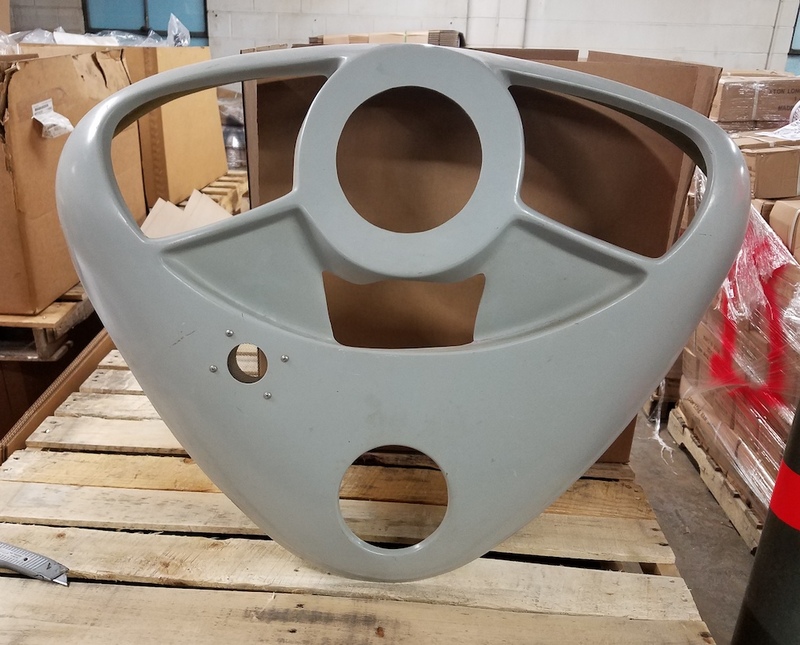 It’s also a fiberglass bowl, but with a much larger air intakes for improved cooling. I was drawn to the Kinney for two reasons: We live in a hot desert; and the word “speed” was in the title. That said, Rio thinks the Kinney bowls are the ugliest things in the world and, “The worst thing a man could do to an Ercoupe.” To be honest, I couldn’t quite picture how our girl would look with one on it, so I started Googling pictures of Ercoupe nose bowls. Which is about the coolest thing I’ve ever seen. Yeah. That’s a real-life Ercoupe nose cowl turned into a steampunk lamp. What’s the story behind it? The lamp is the creation of Darin Carling. His brother Shawn runs an outfit called Machine Age Lamps in Lakeville, Minnesota. The brothers grew up on a small farm in rural North Dakota, so they were good at fixing stuff, creating stuff, or re-purposing stuff. Farm folk like that wouldn’t go out and buy a new cowl. I don’t know if I ever mentioned it, but I wasn’t raised on a farm. Anyway, after leaving the farm, Shawn, in his own words, spent the next 25 years “miscast” in corporate America, until one year at Christmas when he built his father a “unique” lamp out of old tractor parts. His dad dug it, as did everyone else who saw it, and one thing led to another. “Another,” in this case, being the fact that his work is lighting Gordon Ramsey’s Restaurant. The one in Hong Kong. 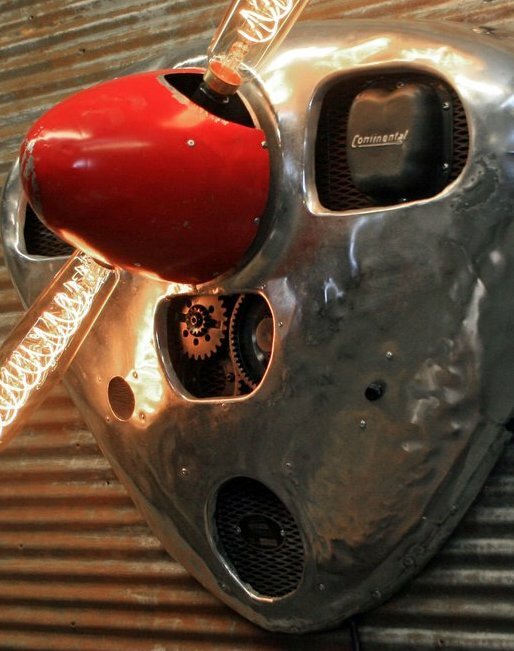 Shawn’s highly successful company creates one-of-a-kind lamps from salvaged antique industrial, agricultural, nautical, and aircraft parts and gauges. 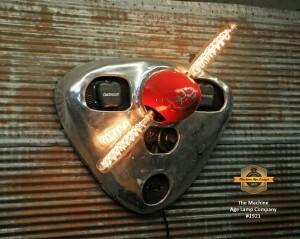 The ‘Coupe cowl light was created by brother Darin, who was encouraged by Shawn to build some items for the businesses. Darin, an aviation lover since childhood, has a deep desire not only to create art, but also to be true to history. “I also do my best to have all the parts make sense,” said Darin, “for example I only put Franklin valve covers in my Stinson cowls. 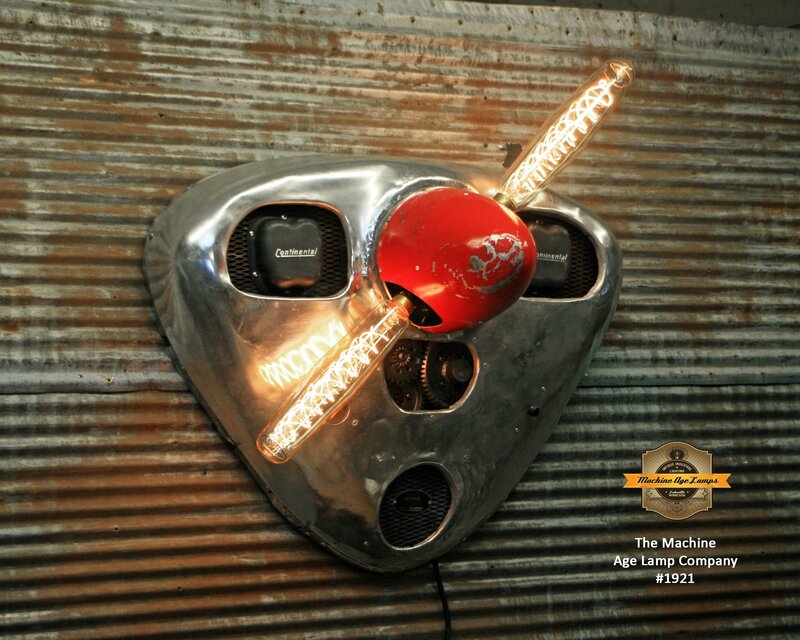 History is very important to me, and to the people that buy our projects.” The Ercoupe lamp has vintage Continental valve covers and assorted engine gears for a cool look. Darin says he always keep track of where the cowls come from and, “If I can get history, I pass that along. One cowl I’m working on now has a photo copy of the bill of sale for the plane back in 1953.” That being said, I can happily report that no Ercoupes were harmed in the making of the ‘Coupe Cowl lamp. Darin bought the cowl from the friend of an Ercoupe owner in Michigan. Apparently, like me, the airplane owner was having a cowl problem. Unlike me, he had the sense to buy a new one. Is Darin a pilot? Not yet, although his father worked for the FAA and brother Shawn has his ticket. Darin tells me he’s finished his ground school. But back to the lamp. How does it work? Despite the old parts, all the electric components are brand new. The Ercoupe lamp is equipped with UL approved wiring, a dimmer switch, and a heavy-duty grounded lamp cord, although Darin says some airplane cowl customers have chosen to have electricians hardwire the lamp for “a clean cordless look,” controlling the lamp through a wall switch. Meanwhile, did I ever find a picture that helped me decide what Tess would look like with an entirely different kind of cowl? No. So for now we’ll probably just keep patching the patches. But I do know one thing: Once we decide what to do, I’ll turn our old one over to Darin and commission him to turn it into some sort of lamp for our hangar. Maybe I’ll have him drill out the hundreds of rivets and have him put a little Christmas light in each hole. Or maybe not. This entry was posted in Ercoupe Ephemera, Maintenance Musings, Plane Passion, Plane People by admin. Bookmark the permalink.